* The Sharp GP1S525 now seems to be sold out, but the GP1S525VJ00F seems to be a suitable replacement and is available from digikey. This picture shows the detail of the sensor circuits. 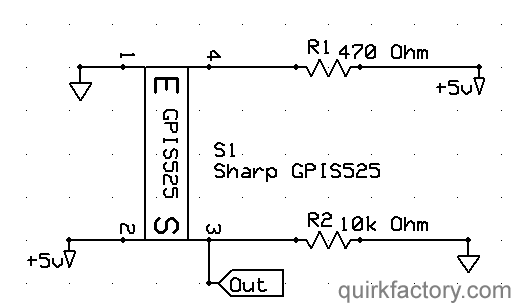 Note the alignment of the emitter and sensor parts of the Sharp GP1S525 which are are labeled on its case. 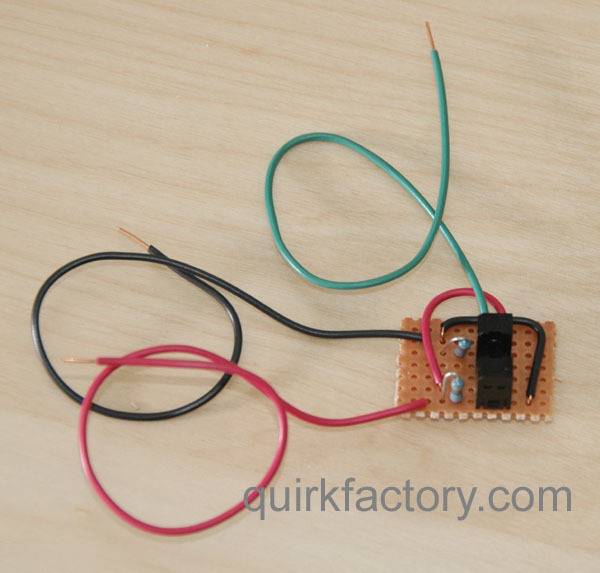 These smallish circuits can be mass-produced on a printed circuit board (which can then be cut into pieces), or else they can be constructed on small protoboards like the one shown here. If constructing the sensors by hand on proto board, the final assembly looks like this. The red and black leads are for +V and GND, respectively. Green carries the data out. 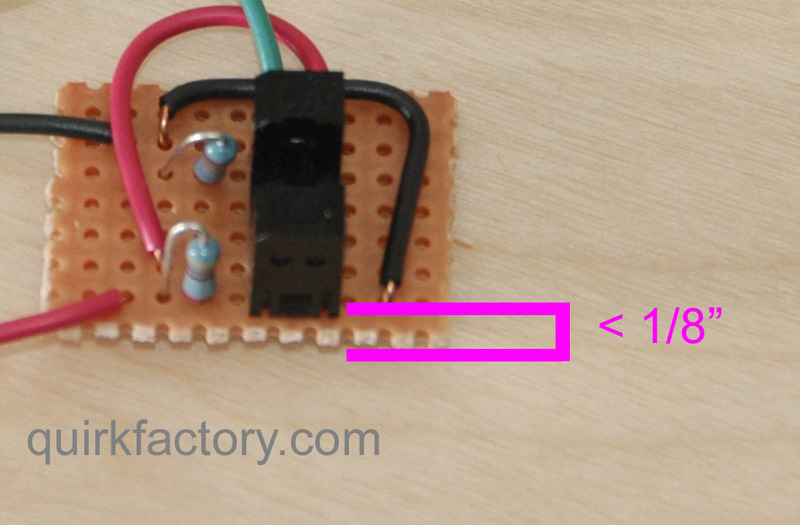 Note that the emitter side of the sensor must be aligned close (less than 1/8") to the edge of the circuit board. In a later step, we will glue a strip of plastic to the side of the sensor. 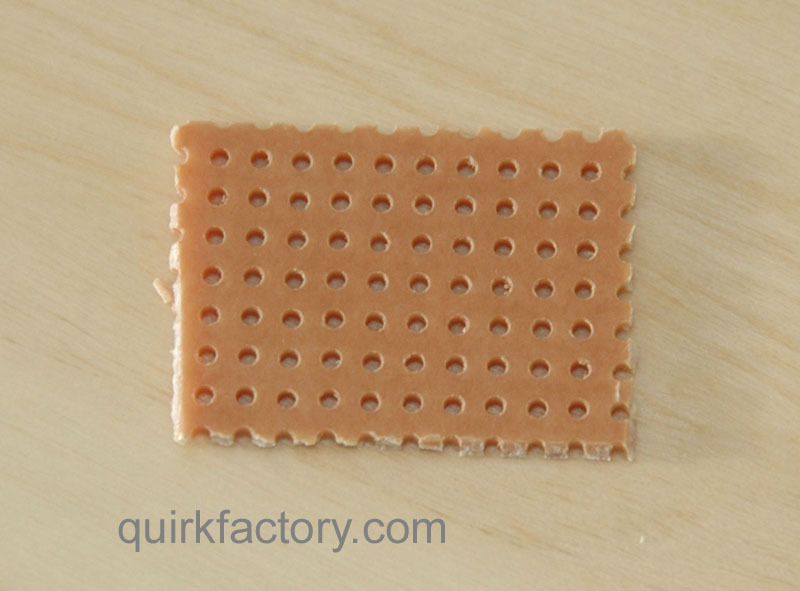 The plastic must extend below the edge of the perf board. 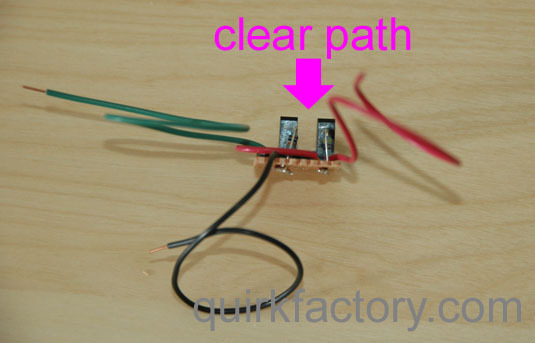 Note in particular that the sensor and resistors must be aligned in a way that allows a clear path through the sensor, as show in this picture. That's it - make seven of these, and test each to make sure that the high/low output state changes when the sensor is blocked. Copyright © 1990-2019 quirkfactory.com. All rights reserved.